<< QUIZ: Win a copy of the 3-disc DVD Eurovision Song Contest 2015! 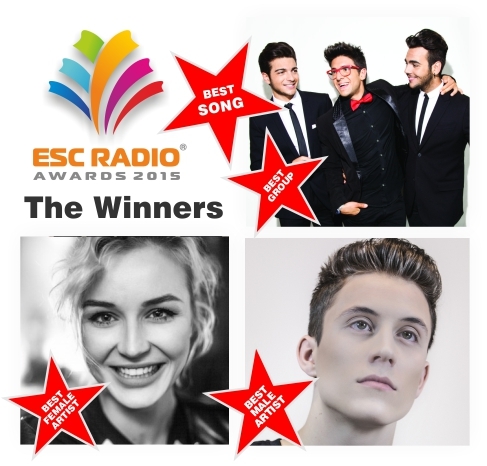 The voting in the 2015 ESC Radio Awards was held from 6-14 June, and the worldwide listeners and fans have made their choice. Votes came in not only from the 40 countries that participated in this year’s Contest, but from all corners of Europe and other parts of the world like North and South America. Many thanks to everyone who voted! Il Volo, Italy’s representatives in Vienna scored the overall victory: Their entry Grande Amore, written and composed by Francesco Boccia and Ciro Esposito, won the Best Song category with 25.92% of the vote, and Piero, Ignazio & Gianluca scored a landslide victory in the Best Group voting with 37.13%, the best result ever in this category. Congratulations to Il Volo and to the writers of the song! 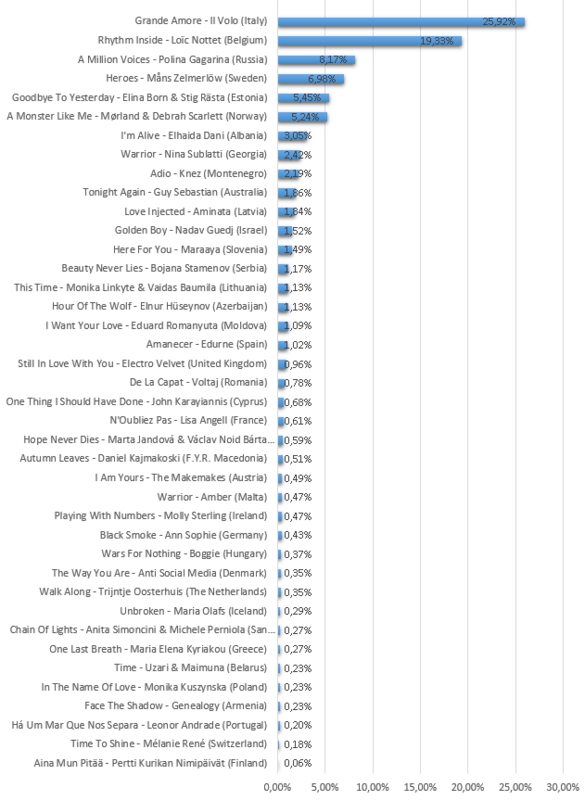 The second place in the Best Song category, with 19.33% of the vote, goes to Belgium’s entry Rhythm Inside, written by Beverly Jo Scott and Loïc Nottet and performed by Loïc Nottet, who also won the Best Male Artist voting (32.10%). The Russian entry A Million Voices, co-written by Gabriel Alares, Joakim Björnberg, Katrina Noorbergen, Leonid Gutkin and Vladimir Matetsky finished in third place with 8.17%, closely followed by this year’s Eurovision winning song Heroes with 6.98%. 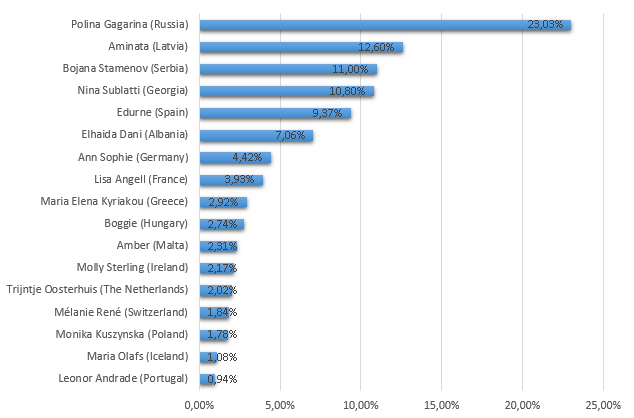 In the Best Female Artist category, Polina Gagarina (Russia) triumphs with 23.03% of the vote, Latvia’s Aminata comes second (12.60%) followed by Bojana Stamenov from Serbia in third place (11.00%). Belgium’s Loïc Nottet who came fourth at the Contest in Vienna wins the Best Male Artist voting with 32.10%, beating Eurovision Song Contest winner Måns Zelmerlöw from Sweden into second place (26.90%). Third place goes to Guy Sebastian from Australia with 14.12%. This marks Belgium’s first-ever win in the ESC Radio Awards since 2006 when the annual poll was started. In the Best Group category, Italy’s Il Volo cruise to a landslide victory with 37.13% of the vote, the highest ever score in this category. 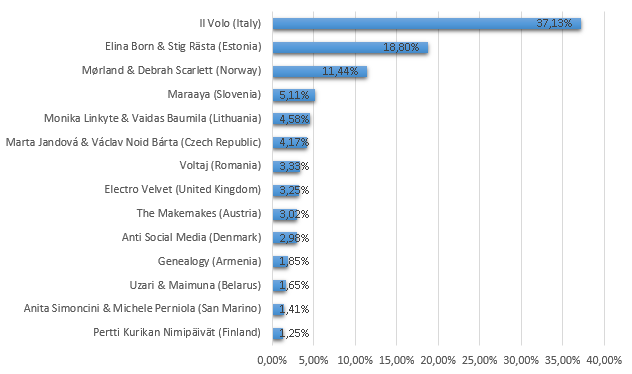 Second place goes to Elina Born & Stig Rästa from Estonia, 18.80% of the listeners voted for them, followed by Norway’s Mørland & Debrah Scarlett in third place (11.44%). Congratulations to all the winners! We will get in touch with them to hand over the trophies as soon as possible. 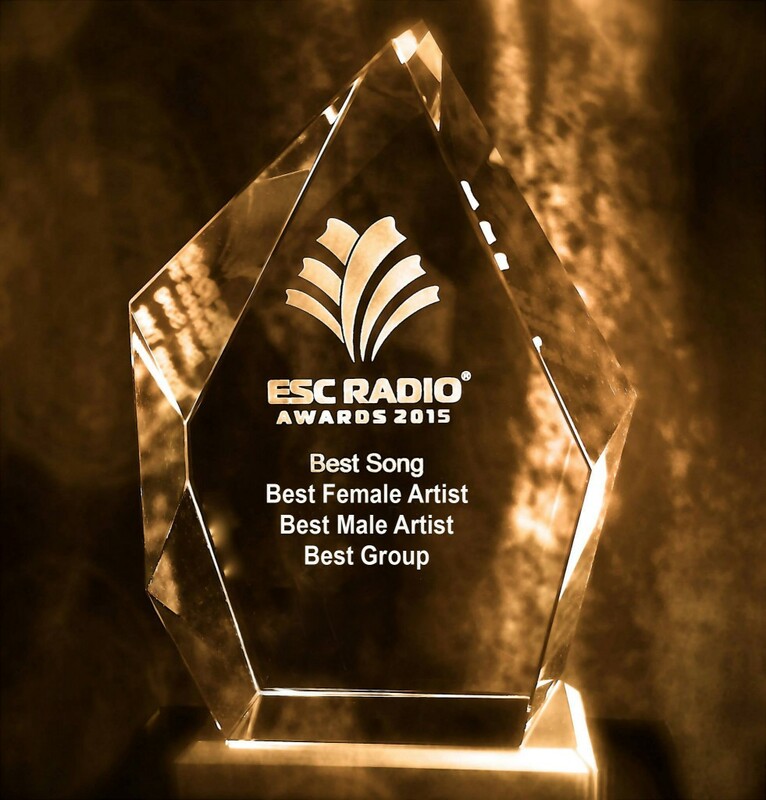 For the complete rankings of the 2015 ESC Radio Awards, see below please. This entry was posted on Monday, June 15th, 2015 at 2:08 pm	and is filed under ESC Radio Awards, News. You can follow any responses to this entry through the RSS 2.0 feed. You can leave a response, or trackback from your own site.